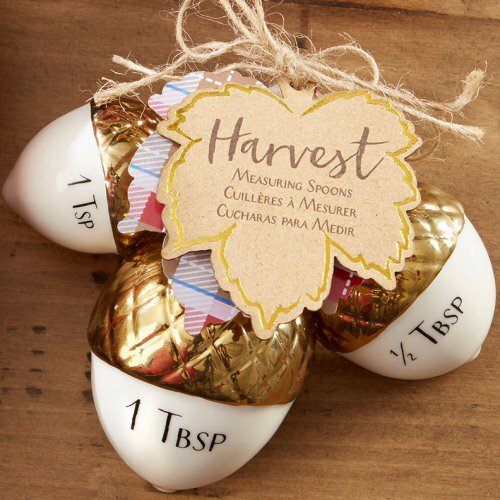 And if you’re having a fall wedding with a fall-themed reception these cute gold-dipped acorn measuring spoons would make a great wedding favor for your guests. I love the idea of kitchen-themed favors because they’re useful and every time your guests use the items at home they’ll be reminded of your big day. Each set of measuring spoons comes with three spoons – 1 tablespoon, 1 teaspoon, and 1/2 teaspoon. And they’re ready to give to your guests thanks to two leaf-shaped decorative tags tied with twine. A perfect gift at your fall wedding! You’ll find these gold-dipped acorn spoons here.